That’s the number of Hashimoto’s thyroiditis diagnoses in the US alone. If you suffer from hypothyroidism, you’re at a big risk of developing Hashimoto’s thyroiditis too. It’s a big problem that just keeps getting bigger. …most doctors don’t have a clue as to how to treat it properly. And that’s really bad news for you and your thyroid. 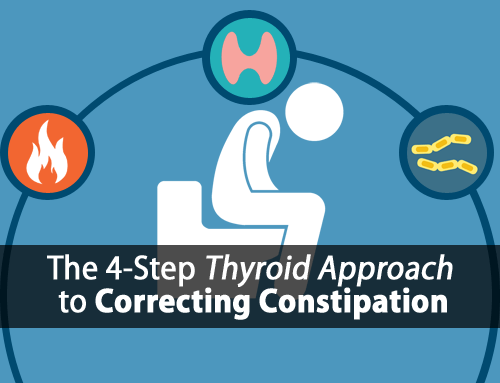 In this post, I’m going to explain how Hashimoto’s thyroiditis develops and one way we help our clients to get their life and health back on track. Remember, this isn’t only about the research. We work with a lot of Hashimoto’s clients and we do see consistent improvements in thyroid antibody numbers. Some of our clients have even had their antibody tests come back in the clear, which is always amazing to see. But remember, in order to understand how to overcome this disease, we need to understand how it develops and what exactly it is doing to your body. Let’s start with the diagnosis. That’s the first place where many doctors get it totally wrong. The problem here is that doctors and the medical system simply just test for so-called ‘anti-thyroid antibodies’, and if they find the presence of these antibodies over a certain level, they diagnose the patient with Hashimoto’s. 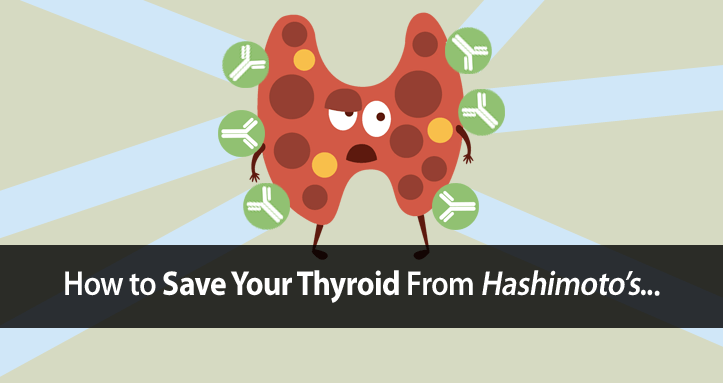 But true Hashimoto’s is when these anti-thyroid antibodies are actually infiltrating the gland and causing destruction or damage to the thyroid tissue. Where doctors can go wrong is that the presence of these antibodies in the blood is not necessarily an indication of the thyroid gland actually being harmed or damaged. Though certain antibodies have names associated with the thyroid, they have many functions unrelated to the thyroid. In some cases, people have high levels of antithyroid antibodies in conjunction with other autoimmune diseases, for example: arthritis, Sjögren’s syndrome, or other autoimmune cases where we see elevated levels of antithyroid antibodies, yet we see no damage to the thyroid gland. Thyroid hormone autoantibodies in primary Sjögren syndrome and rheumatoid arthritis are more prevalent than in autoimmune thyroid disease, becoming progressively more frequent in these diseases. So, just seeing the presence of the anti-thyroid antibodies isn’t enough to confirm a diagnosis. The only way to determine that is to do a fine needle biopsy of the actual thyroid tissue to look for physical signs that the thyroid tissue itself is being infiltrated or damaged. 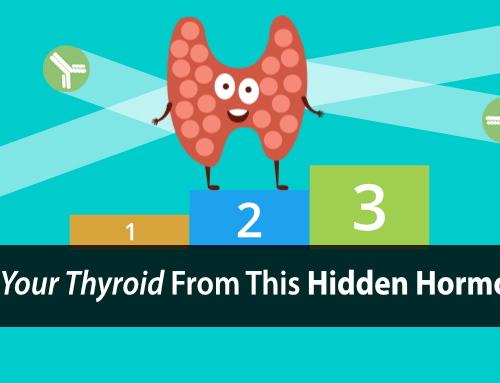 Now, let’s take a closer look at how Hashimoto’s thyroiditis develops. It all starts with hypothyroidism. In fact, Hashimoto’s thyroiditis stems directly from hypothyroidism, which is why we address the two conditions very similarly. If you’re a frequent reader here at Forefront Health, then this is going to sound a little familiar. It’s something that we see all the time with clients, and something we’ve talked about in lots of other articles. I’m talking about estrogen dominance. People who are hypothyroid both overproduce estrogen and cannot detoxify it, causing it to accumulate in their body. Needless to say, both of these problems tend to cause estrogen to build up to dangerous levels. Unfortunately, this isn’t caught through blood testing because estrogen tends to accumulate in the tissue, not in the blood. This is important to point out, because many times, when people are tested for estrogen, the blood tests are normal or even low, when tissue levels can be up to 50 times higher. Regardless of the mechanism, you end up with long term exposure to high levels of estrogen. And prolonged exposure to excess estrogen is shown to significantly increase the production of Hashimoto’s thyroiditis TPO antibodies. 2-Methoxyestradiol, an endogenous estrogen metabolite, induces thyroid cell apoptosis. There’s also empirical evidence that further implicates estrogen’s role in Hashimoto’s thyroiditis. Considering that women produce far more estrogen than men, one would expect that women would experience a higher incidence of Hashimoto’s thyroiditis. Not only is the incidence of Hashimoto’s thyroiditis in women higher than men, it’s 20 times higher. And what’s more, women are more likely to be diagnosed during times of their lives when estrogen dominance is most severe. Men produce estrogen and men can greatly overproduce estrogen through aromatization as well. So this can definitely happen to men, but Hashimoto’s is an issue that affects women to a much greater degree. For all intents and purposes, this points to estrogen as being a big part of the problem. We’ve already established that estrogen dominance plays a central role in the development of Hashimoto’s thyroiditis. And it stems from estrogen’s effects on your thymus gland. The thymus gland sits right behind your breastbone and it plays the important role of regulating your immune system. You see, estrogen (and cortisol, which is also overproduced in hypothyroidism) causes involution, or degeneration, of the thymus gland. Not only does estrogen damage your thymus gland, it also increases the production of autoimmune antibodies. 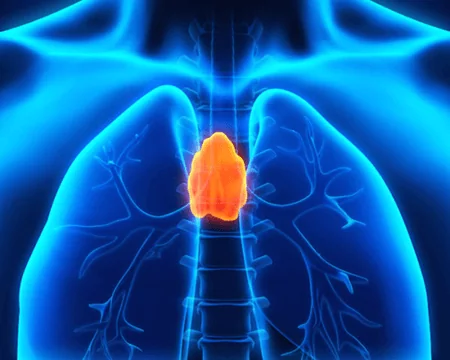 So, for people who are having issues with Hashimoto’s thyroiditis or other autoimmune conditions, and want to help regulate their immune system… restoring the thymus gland is essential. Interestingly, progesterone (and thyroid hormone), which opposes estrogen very strongly, has been shown to reverse damage to the thymus gland. 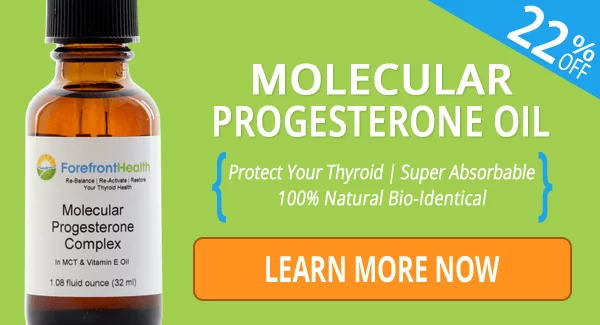 We use both our Molecular Progesterone Oil and our Raw Desiccated Thyroid with our Hashimoto’s clients. …but with respect to Hashimoto’s thyroiditis, estrogen directly affects the thyroid gland in a very dangerous way. Estrogen is known to increase Thyroid Stimulating Hormone (TSH), while also inhibiting the proteolytic enzymes that are needed for the gland to release thyroid hormone into your bloodstream. 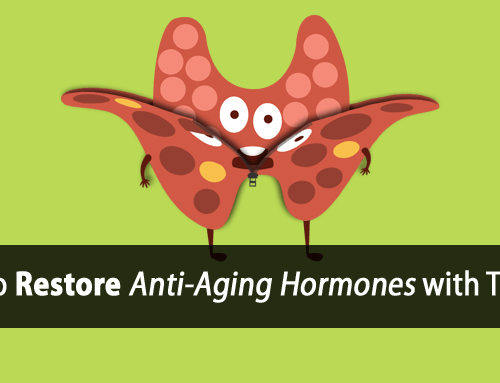 In other words, estrogen stimulates your thyroid gland to produce more thyroid hormone… yet, at the same time, it also inhibits your thyroid gland from releasing that thyroid hormone. This causes a buildup of thyroid hormone (colloid) within your thyroid gland. And this is a big reason today why Hashimoto’s sufferers develop goiters or soft nodules on their thyroid gland. It’s important to point out that if you do have a goiter or enlarged thyroid nodules, then it’s often best to begin with supplementing thyroid hormone, rather than progesterone to help lower your TSH first. 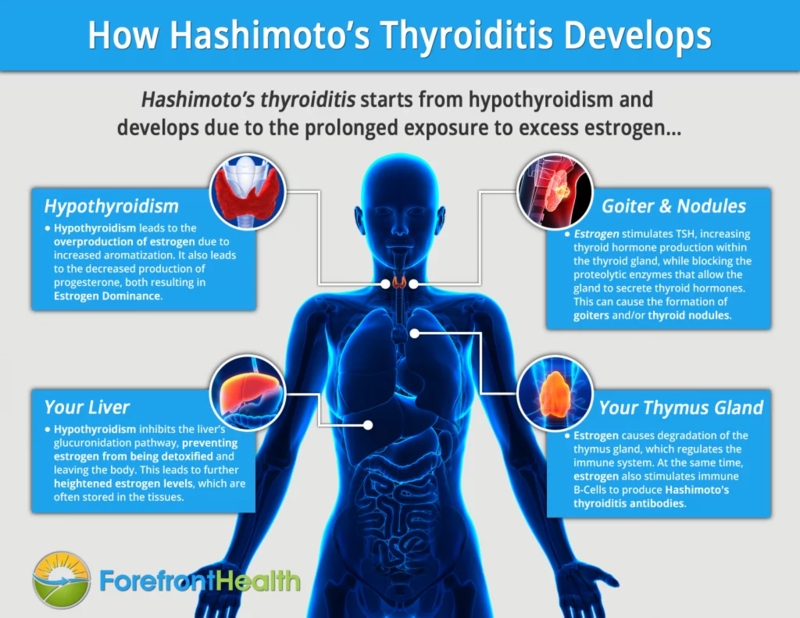 While prolonged exposure to estrogen is a primary factor in the development of Hashimoto’s thyroiditis, it’s not the only one. That’s the basis for how Hashimoto’s develops. Development of goiter and nodules. Most people with Hashimoto’s thyroiditis are not addressing the estrogen concern. They’re not addressing the thymus gland. Ultimately, what this boils down to is, if you have Hashimoto’s, you have to address the underlying cause. In other words, you must address the estrogen issue. How much progesterone do you take to make sure it doesn’t turn into estrogen, that’s been my issue? It’s not that progesterone is converting into estrogen. 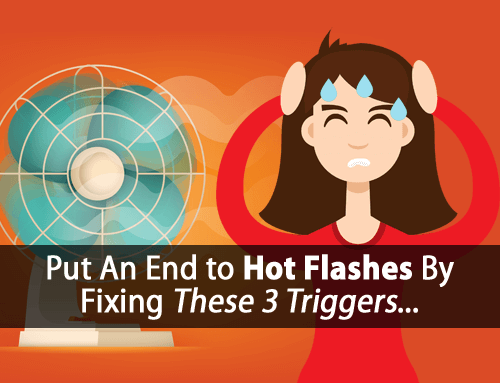 When there’s a lot of estrogen stored in the tissue, progesterone tends to push it out of the cells and back into the bloodstream, which can increase symptomatic response. This is why we often have to start with larger doses to help minimize this effect. Brilliant article as usual Tom. Thank you! I am trying to help a friend who is diagnosed with Hashimotos. I have passed this article on to her. Keep the good articles rolling. Hi, I have hishimotos and have had a goitre since I was 13. Am now 45 and under a ultrasound my thyroid is unrecognisable as an organ. So covered in nodules. Biopsy confirmed hishimotis. I started your progesterone but it must be good cause within 5 days I started my period. I am not perimenopausal. When should I start and stop cause it actually brings on my period very quickly.. Excess estrogen and/or progesterone deficiency will prevent menstruation and is a common reason why many women stop menstruating early. So, signs of restored menstruation is a great sign. If you cycle it 14 days on and 14 days off your menstrual cycle will eventually sync to that. Men are much less likely to be diagnosed with Hashimoto’s because they produce far less estrogen, as mentioned in the article. If he’s taking thyroid medication and it’s keeping his TSH low, then that provides further protection. I am on bioidentical estriol and progesterone .. also this past year diagnosed Hashimotos … how do I know if to continue? I was diagnosed with hypothyroidism 10 years ago and am on the following meds: 1 1/2 tablets of Liothyronine (5 mcg) along with 1 tablet of Levothyroxine (50 mcg) daily. Two years ago I was diagnosed with thyroid nodules (3),two very small, one just large enough to require a fine needle biopsy, which came back negative for cancer cells. I just recently had an ultrasound which indicated the nodules have remained the same in size. My concern going forward is I would be interested to know what I could do to eliminate the nodules completely and I am also concerned with preventing progressing to Hashimoto’s thyroiditis status. What suggestions do you have? I feel pretty good for a 68 year old and have lots of energy, all other blood work was good with the exception of a high C-reactive protein level which i am looking into ways to lower (naturally). I have normal BP and take no other drugs nor have any health problems. Keeping TSH well under 1 should help the nodules from continuing to grow. But, everything mentioned in the article is still applicable. I read through this article and most of it fits, except the initial hypothyroidism. I have trouble getting providers to agree that I have Hashimoto’s at all because my TSH has been normal – completely normal. My T3 or T4 was out of normal range twice ever back in 2002/2003 and not drastically out of range. But I am now facing huge Autoimmune disease with the destruction of my joints and loss of kidney function and the providers put me on a Protein Sparing Modified Fast because I wasn’t losing weight any other way, and I have had one or two elevated cortisol 24 hr tests. I have a colloid nodule. So if you have normal TSH, how does all of this fit in and what would be the fix? Same thing you have posted? Thanks! How often should you take it if you are post menopausal and do you have to take it for a lifetime? Tom, I have Hashimotos (confirmed in 2005 with biopsy) and MS (kept at bay). I try to be aggressive about how I am dealing with these without taking meds. So far so good. As I am getting older I would like to maintain the health I have worked so hard on. Having said that, I really do need a ‘formula’ for what I should be doing. I am currently taking the Vit. D/K drops and protein which have been a great asset to my energy levels. It is my intent to continue to reverse both of my issues, so I am just wanting to make sure I have all the pieces to the puzzle. Please feel free to be direct and candid. I get very busy and do not always take the needed time to thoroughly read through the articles. I have a question to ask what tests do i need to do in order to detect if i have thyroid disease or imbalance. I have done T3, T4 and TSH studies and they all show as normal, but i still have a feeling that i could have some thryoid issue. please reply. How do I lower my tsh? It’s 3.88. I need to lose weight. If TSH is elevated, then supplementing thyroid hormone will help. Vitamin A can help too. Tom: Are you saying, then, that everyone who has antibodies show up in blood work should have a biopsy in order to know if their thyroid is being damaged or not, since the simple presence of antibodies does not determine if the thyroid is being damaged? I’m not saying that you should have a biopsy. I’m saying that a biopsy is the only way to diagnose true Hashimoto’s thyroiditis. Tom, my estrogen is way too high for a woman who is post-menopause. My doctor didn’t even mention it or anything about how it may be related to the thyroid problem. Should I just take progesterone anyway? 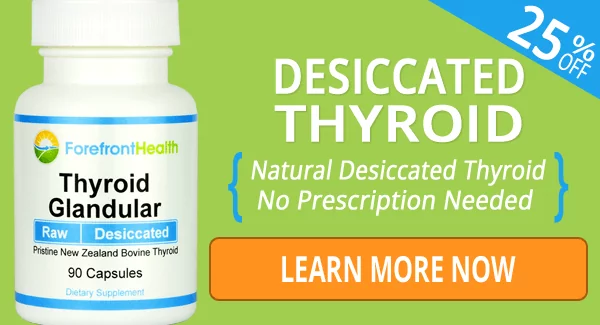 Hi Terry, we believe in educating thyroid sufferers to make informed decision about their thyroid health. Excess estrogen is certainly an issue. However, the medical community refuses to recognized it because they continue to prescribe it. Admitting it would pose too large of a conflict of interest. So, instead it’s just ignored, which is why your doctor isn’t aware of it. How do I easily. access all your articles?….that could answer nagging questions. Is there a link to all list of blogs/articles that you have written ..like a library of all of them..easily accessible especially to all who are members of your protocol Hypothyroid Revolution like me. Hi Jacy, that’s something we’re working on and hope to have ready soon. Not only due estrogen cause issues, but synthetic progestins (not bio-idential progesterone) cause issues as well. Prempro has both.